According to legend, in medieval Europe, fiddle music was allowed to be played in the church, but dancing was forbidden. It became obvious that fiddling made the congregation tap their feet. They say that’s the moment the fiddler was expelled from church and the fiddle was named ‘The Devil’s Box”. 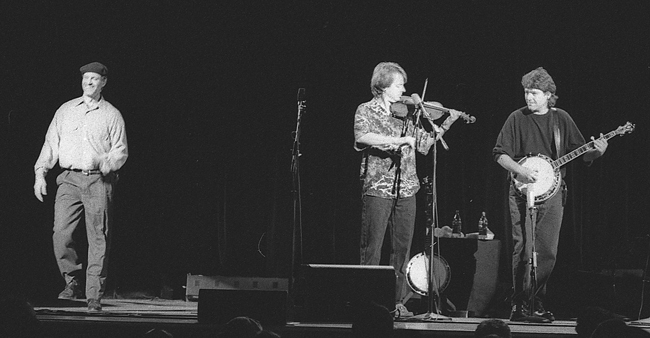 An extra string was added to the three-string fiddle which they called “the devil’s string”. Who knows what truth a legend may hold? Buck and Wing Dancing and Flatfoot Dancing are tradition-based rhythm styles which can be performed without musical instruments using only foot rhythm and hand clapping. 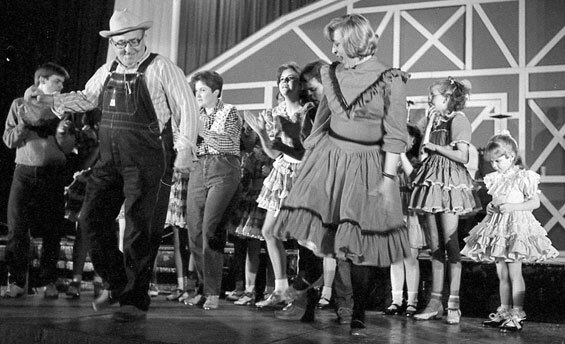 Add one or two instruments or a whole band and you will end up with a Hoe-Down or Square Dance, Southern style. In any Southern music gathering sooner or later a buckdancer will jump into the fray. Of the many styles of old time and flatfoot dancing, the style I am most familiar with is the hard driving footwork of Robert Spicer. With silver duct tape wrapped around his palms he used his strong farmer’s hands to clap out the rhythm for the dancers. The results were hypnotic and enticing––not a still foot in the audience. “Carmack” keeps time for Jacky Christian. There is no way to measure the impact of the team of Robert Spicer and Jacky Christian. Old Time music and dance would have never gained the prominence, however modest, that it has today. Together they created the most successful traditional dance and teaching partnership in Tennessee’s history. Not every musician wants to be a dancer. The numbers of musicians whose talents include simultaneous dance steps are few. You can still enjoy the incredible dancing of bassist and old time banjo player Mark Schatz and the landmark dance troupe, The Fiddle Puppets. 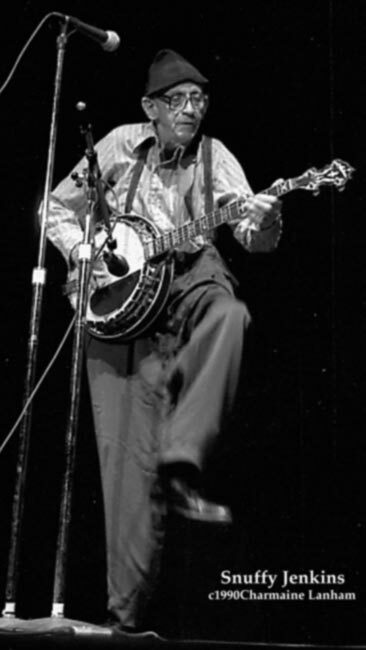 Bill Monroe started his career as a square dancer for WLS Barn Dance. With his brothers Charlie and Birch, they booked themselves as The Monroes and mixed dancing into their music performances. They were the official exhibition Square Dance Troupe for the 1933 Chicago Worlds’ Fair. 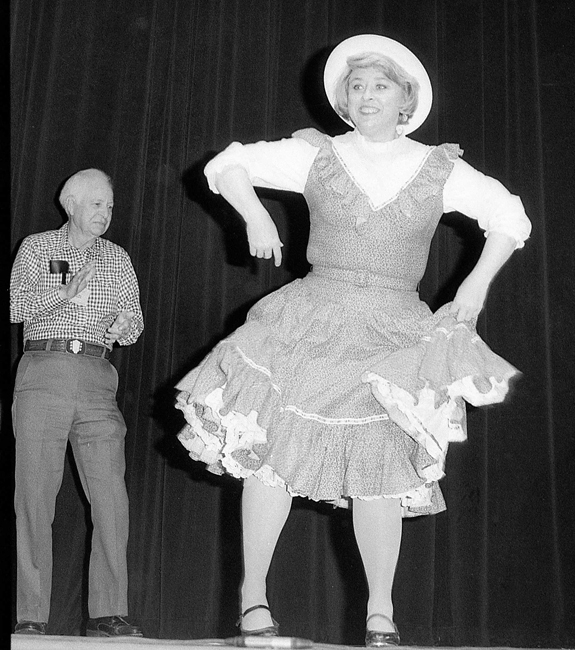 Since I knew Bill later in his life, after his famous auto accident and his broken leg, I never managed to get a full length picture of Bill dancing. He only did a few steps each time, breaking into a backwards skip, a step he called the “Kentucky Backstep” and it was over before it began. He never failed to please the audience with those few dance moves. 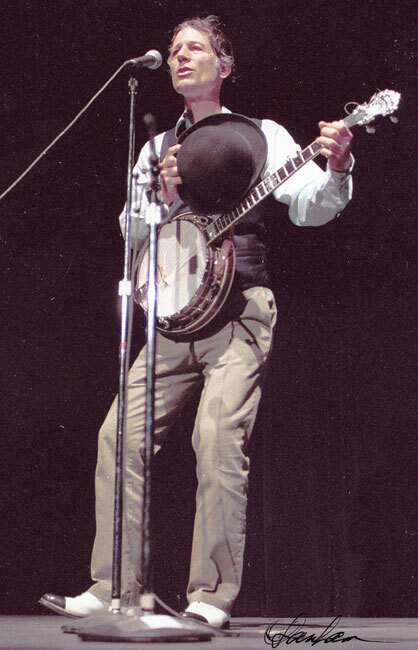 John Hartford was one of the great entertainers of all time, a vaudeville-style performer who could dance, fiddle and sing his self-penned songs all at once. As a dancer, John needed some way to amplify the sound of his feet. First he tried turning a plastic food try over and dancing on that, but it was too small. When dancers get together there is usually a 4×8 plywood board placed on the ground or the stage for sound and ease of movement on the soles of the shoes. But that was not something John could carry around. He finally settled on a 3×3 piece of plywood and brought it to my husband, luthier Marty Lanham, to install a guitar pickup in the plywood which could then be plugged into the sound systems. As I develop my blog I will share moments and images from the great friendships I found and the shows I covered during my career. It will take many installments to share stories from my 40+ years of photographing the great musical figures in Bluegrass and acoustic Music. The Tradition of stringed music and dance is alive and well in Tennessee.Hopefully these celebrity vignettes and memories will be enjoyed by others who play acoustic music, follow it as fans and love it ‘better-than-anything’.